Discussion in 'Storage & Backup' started by windwithme, Jan 25, 2013. Solid-State Drive does improve C performance in past 4 years. 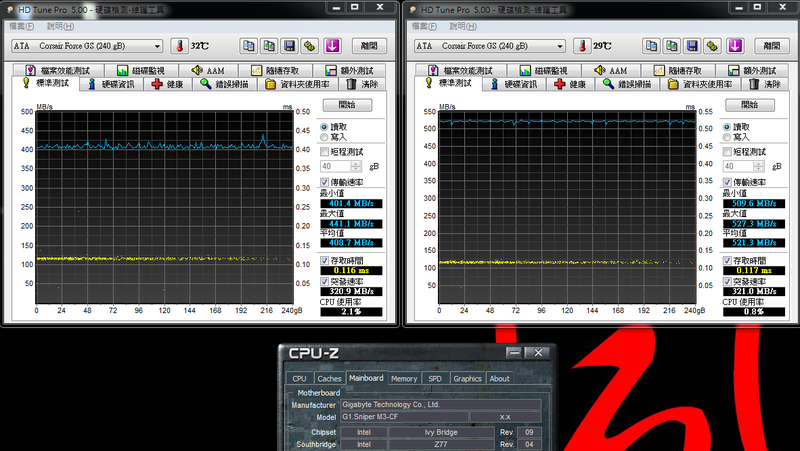 No matter DeskTop PC or Notebook both shorten the system processing time. It?s why SSD still so popular after launching many years. However, the high price also impact the popularity. Every year, SSD price is almost 50% off. The price segment is based on 100 or 200USD. As history price record, 2 years ago, 200USD only could have 60GB, last year was 120GB and this year is 240GB. 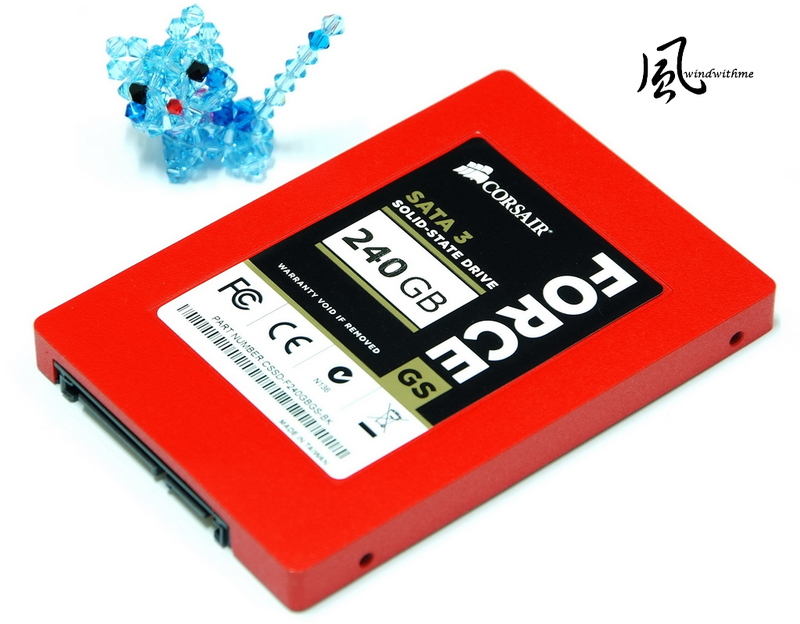 This year, you can find many 120GB SSD below 100USD. This price point is acceptable. 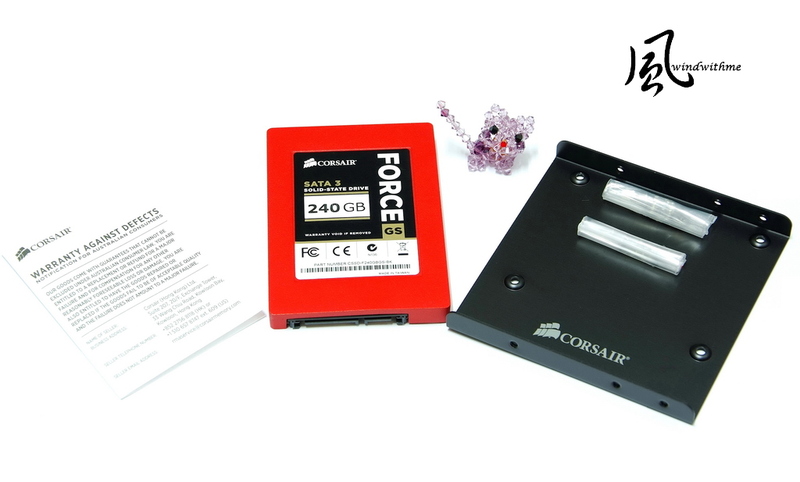 3 years ago, CORSAIR, from USA, started their SSD product line which was pioneer in this field. Controller also moved from SAMSUNG to SandForce or Marvell. Different controller focus on different performance and price segment. 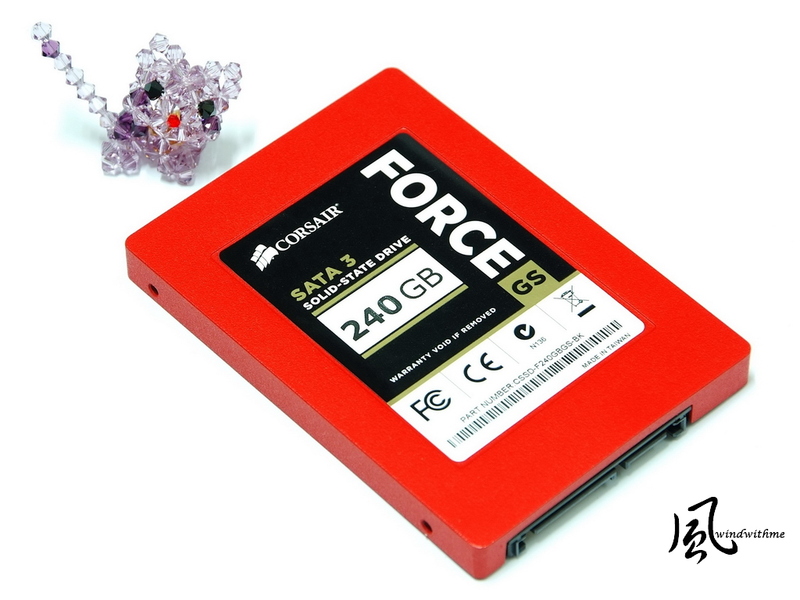 This GS SSD is Force Series. It had Force 3 and GT, 2 versions. 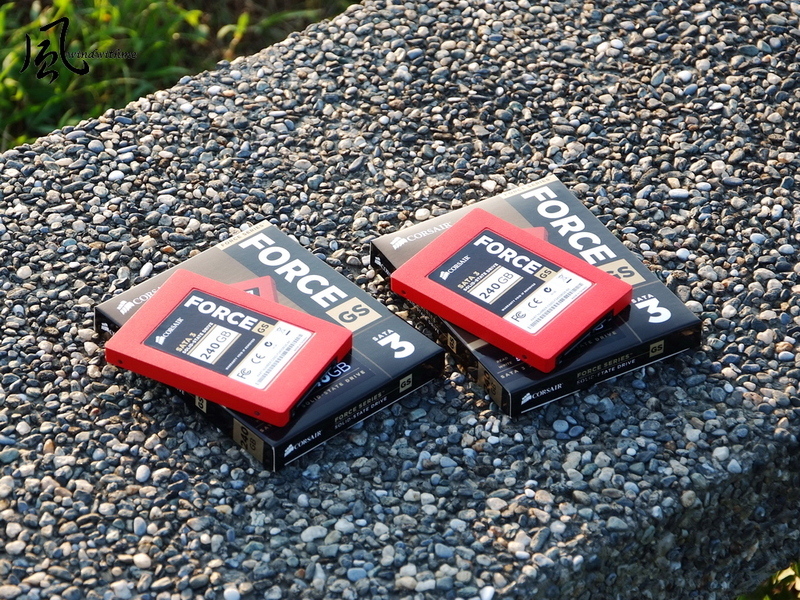 Force Series uses SandForce controller with different NAND Flash ICs. Let?s look at packing first. Gold is a representative color of GS. 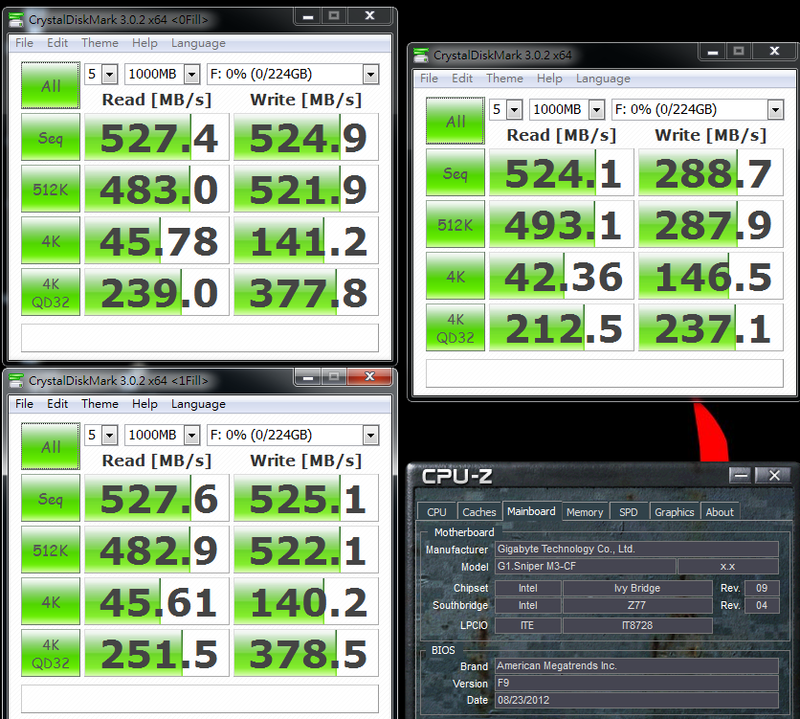 Left side is product warranty card, middle is Force GS 240GB and right side is back 2.5? to 3.5? rack and screws. Product size is 2.5?. The capacity is 240GB.，Official max speed is 555/525 MB/s at ATTO Disk Benchmark. Random 4K max write is 90k IOPS. It?s very high specs of 4K performance in current SSD market. Metal shell with red coating and tactile impression is grain texture. CORSAIR offers 3 years warranty. The family has 128/180/240/360/480GB. Capacity provides rich choices. Users can choose the suitable one by budget or demand. Back is black metal with matte hair line. It improves the product texture. Lower left is SATA3 and power connectors. Next is silver laser sticker. As warranty and internal hardware safety, we better to keep it in original state. 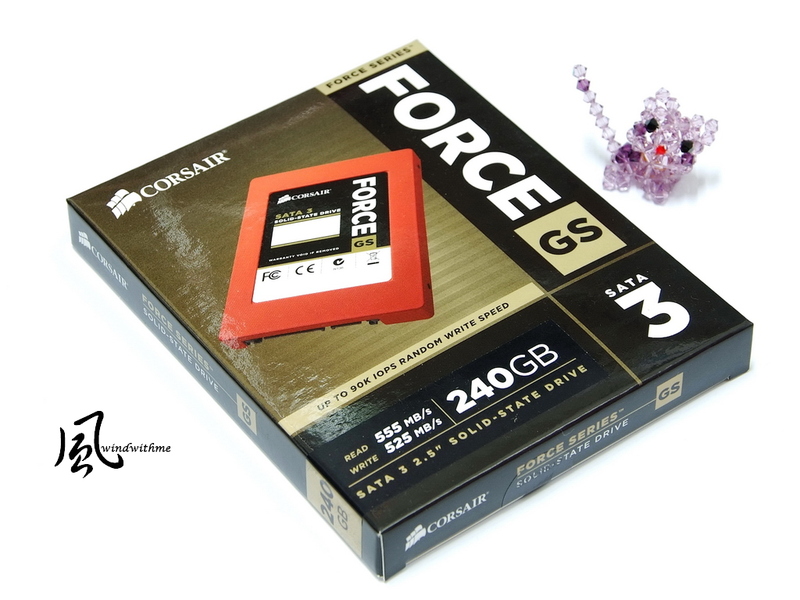 Force Series GS uses popular SandForce SF-2281 controller. NAND Flash uses 16 SanDisk Mark 24nm ICs, 16GB each. If you are interested in Force GS internal build, you can search in Google. 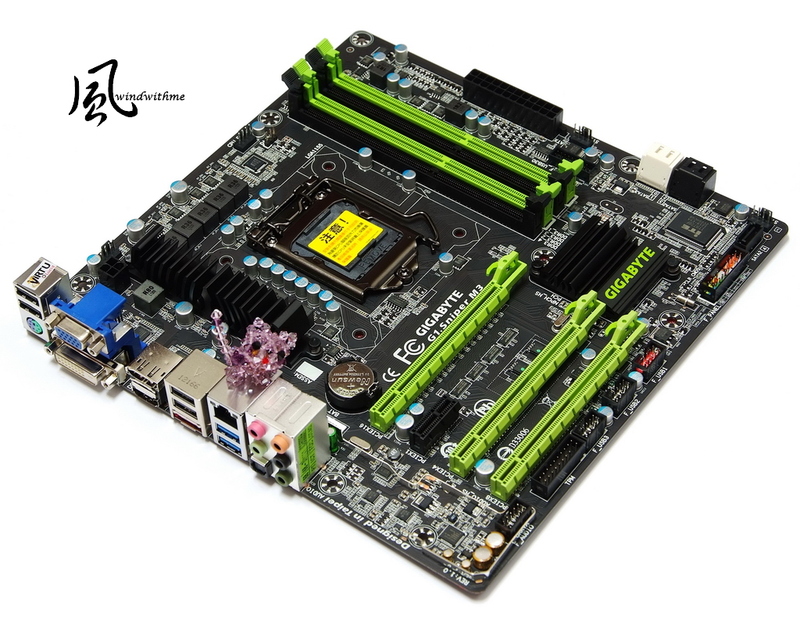 The test platform is Intel Z77 chipset, GIGABYTE G1.SNIPER M3. It?s mid-end gaming series using Micro ATX. It emphasizes audio and LAN chips. It equips Creative latest CA0132, quad-core audio processor. It supports THX, CRYSTAL VOICE, and etc. It has 3 PCI-E X16, 1 PCI-E X1. 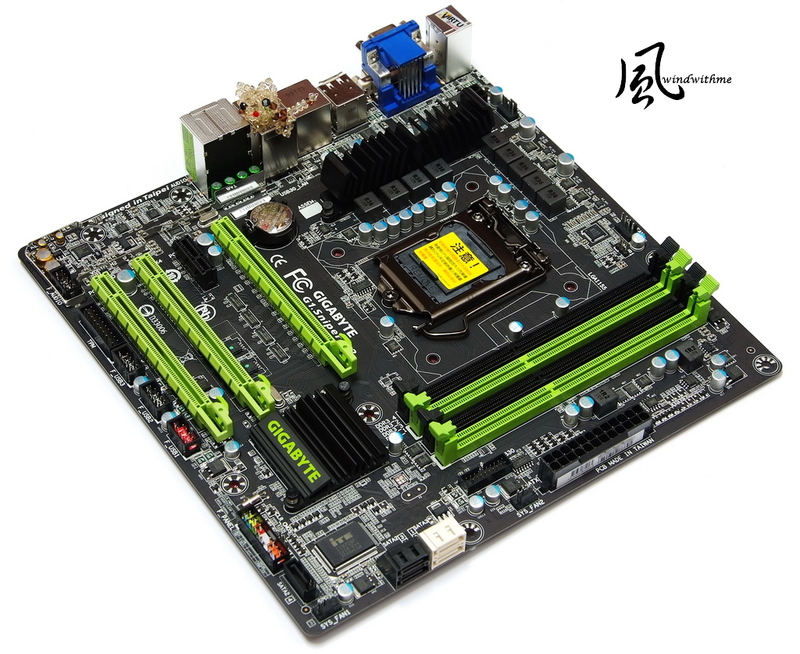 The expandability is very good as Micro ATX form factor. 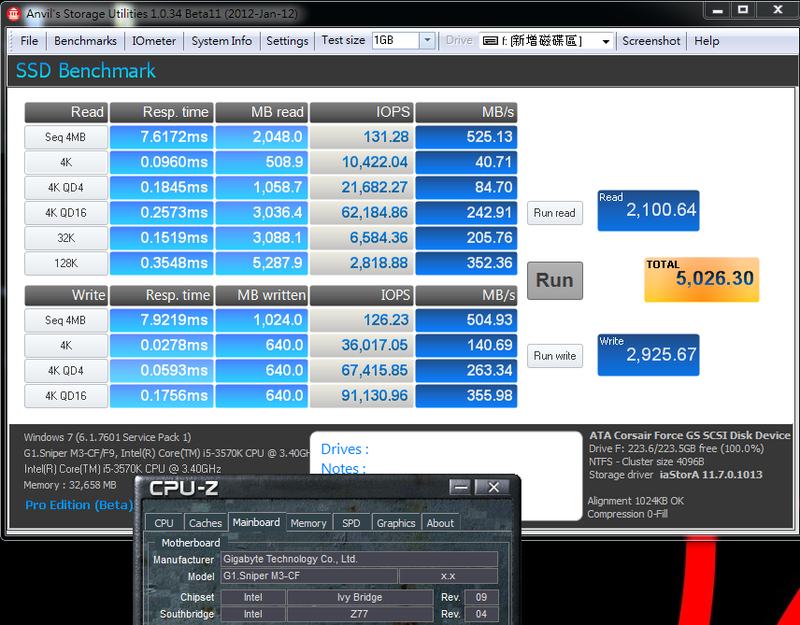 Also Intel chipset IO performance is better. The SATA3 should have better performance in SSD. None OS system drive without any data. 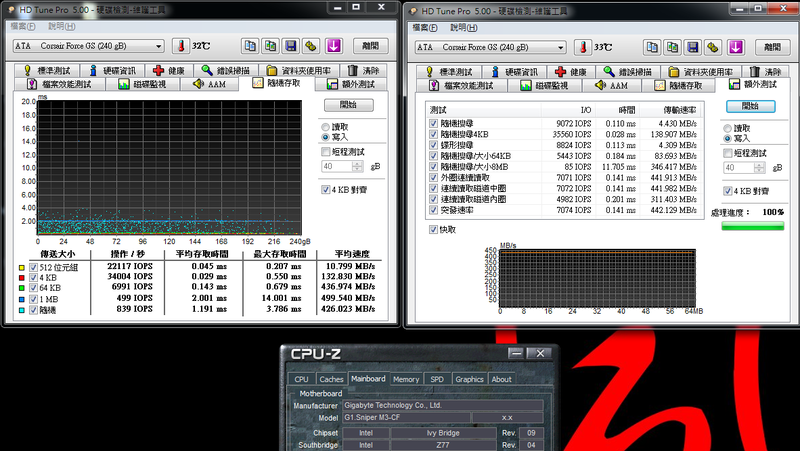 Test at Intel Z77 platform. Black Size is the special part of this software. Left side default is 64K and right side is 1MB. HD Tune Pro 5.00 set Black Size as 1MB almost reaching the best performance. CrystalDiskMark default test is random. You can see right side performance is lower. It?s characteristic of SandForce controller. It has lower performance in random algorithm. Left pic is CrystalDiskMark sequential mode. The write performance is close to official specs. 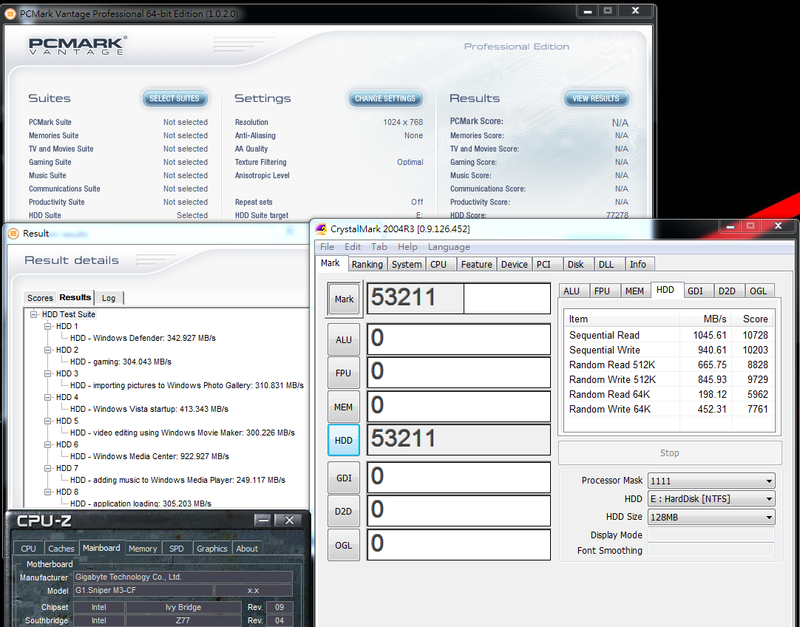 AS SSD Benchmark Seq Write is similar to CrystalDiskMark. 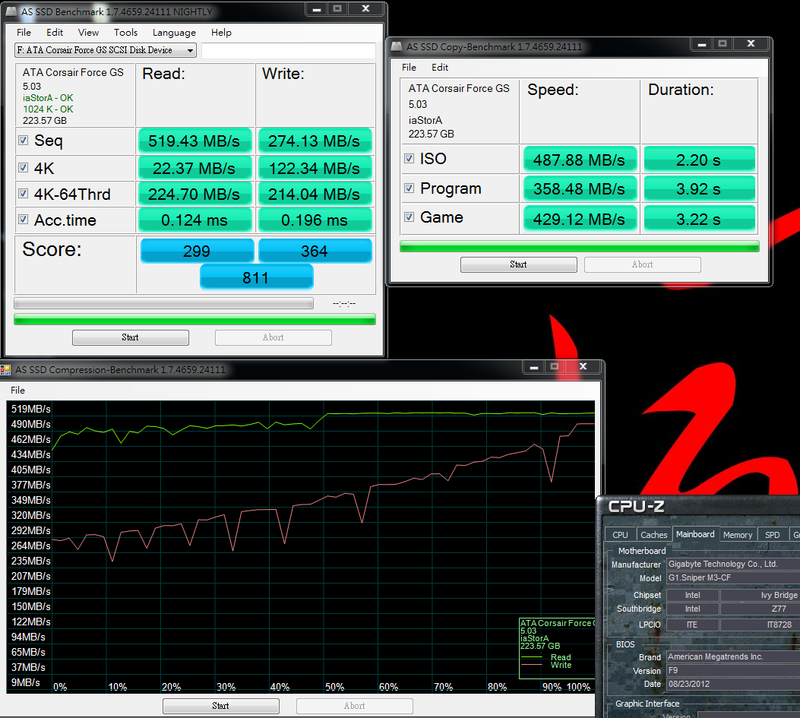 Compression Benchmark write starts from 280MB/s to over 480MB/s. SandForce in Sequential Write uses special algorithm, this is key weakness of SandForce controller. 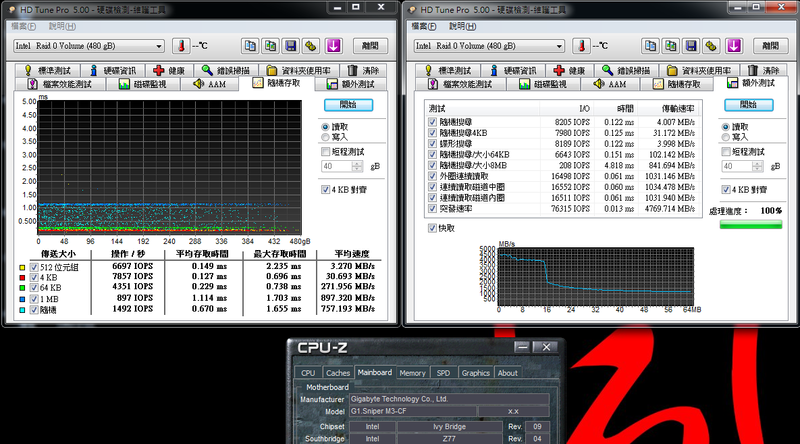 In sequential or random read, 4K performance and continuous write, SF-2281 controller is very good. 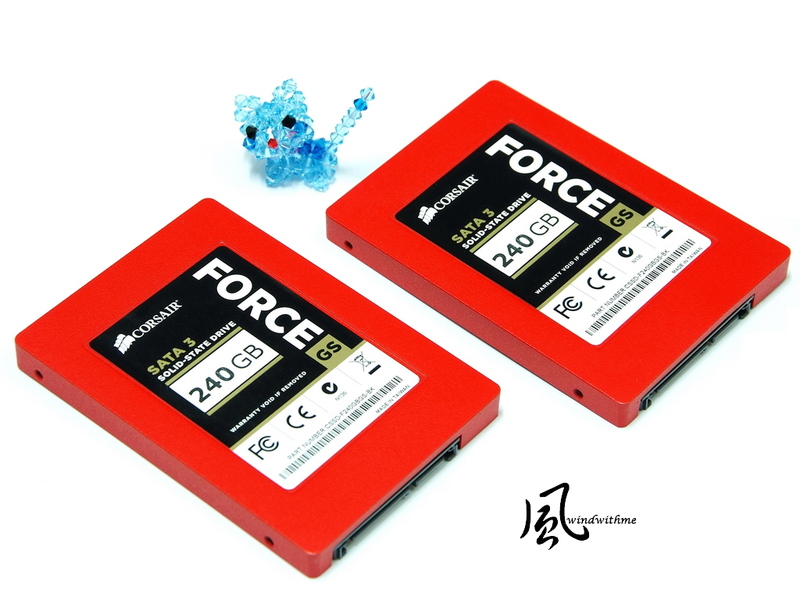 The former review of SandForce SSD, the performance is lower after 3 minutes. It may be caused by firmware. 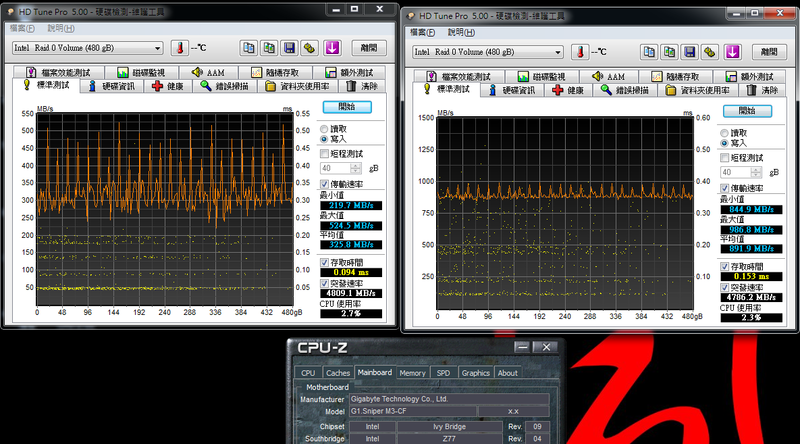 As GS using SandForce controller, IOMETER 2008 Random Read / Write 4KB test are very good. 1 minute and 3 minutes test difference is minor. You can treat it as acceptable deviation. 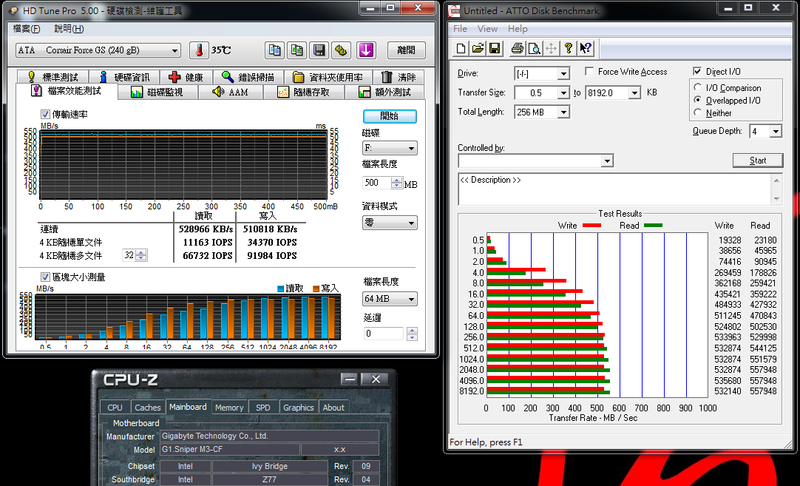 This result is much higher than 3700 by Marvell 88SS9174-BKK2 controller SS. You can see SandForce controller SSD still has his advantage in some software. Second part is two 240GB GS runs at Raid 0 mode. Two CORSAIR Force GS 240GB both install at white SATA3 port. Black Size is the special part of this software. Left side default is 64K and right side is 8MB. HD Tune Pro 5.00 most items are almost double speed. CrystalDiskMark scores are also the same. 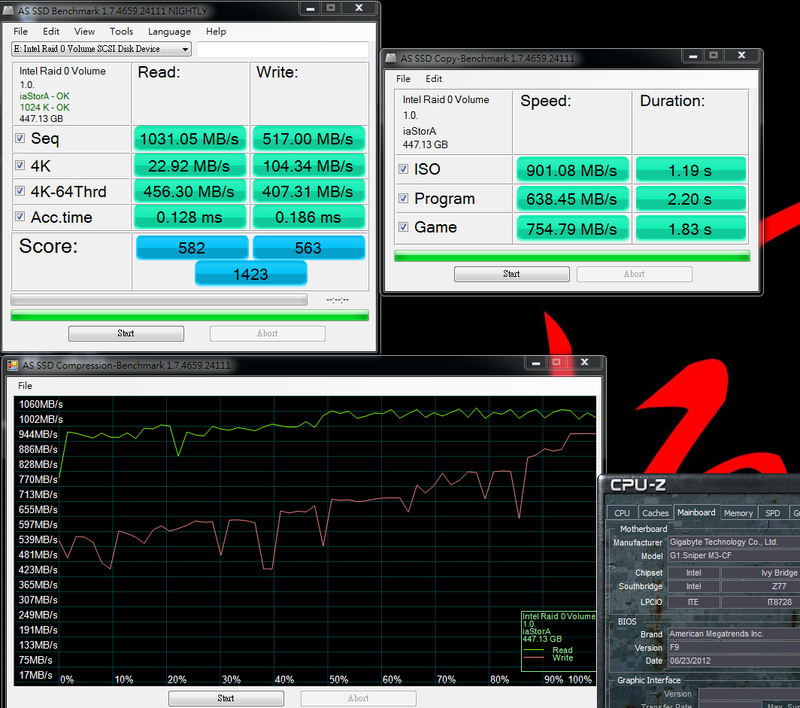 ATTO DISK Benchmark is a good software to test SSD best read/write performance with short time. The max score is almost double as well. You can see the Raid 0 mode really improves the performance. In Raid 0 mode, AS SSD Benchmark score increases about 75%. 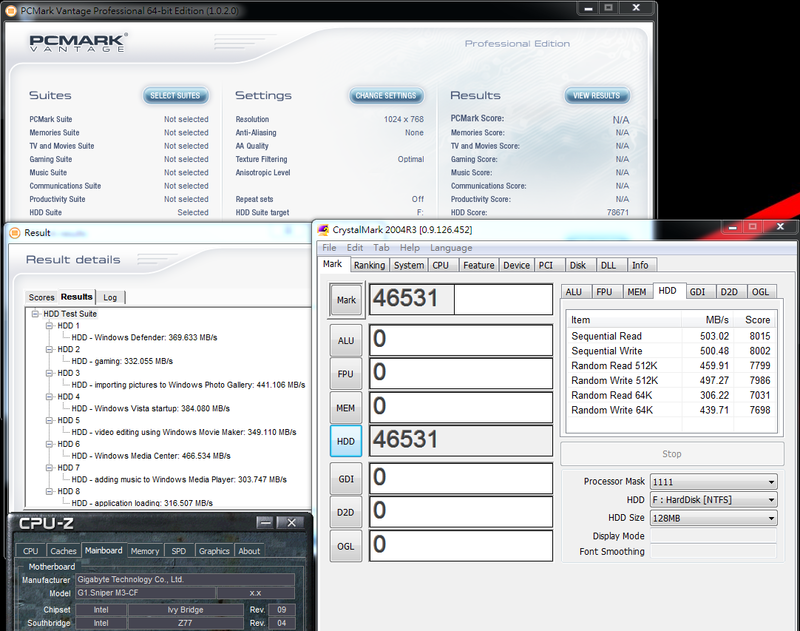 PCMark Vantage HDD Score is same as single drive. I think it?s software issue. CrystalMark still has almost double speed. IOMETER 2008 Random Read 4KB increases 24~35%. 1 minute to 3 minutes later, the performance drops 9%. IOMETER 2008 Random Write 4KB increases about 23%. This software also increases 48%. 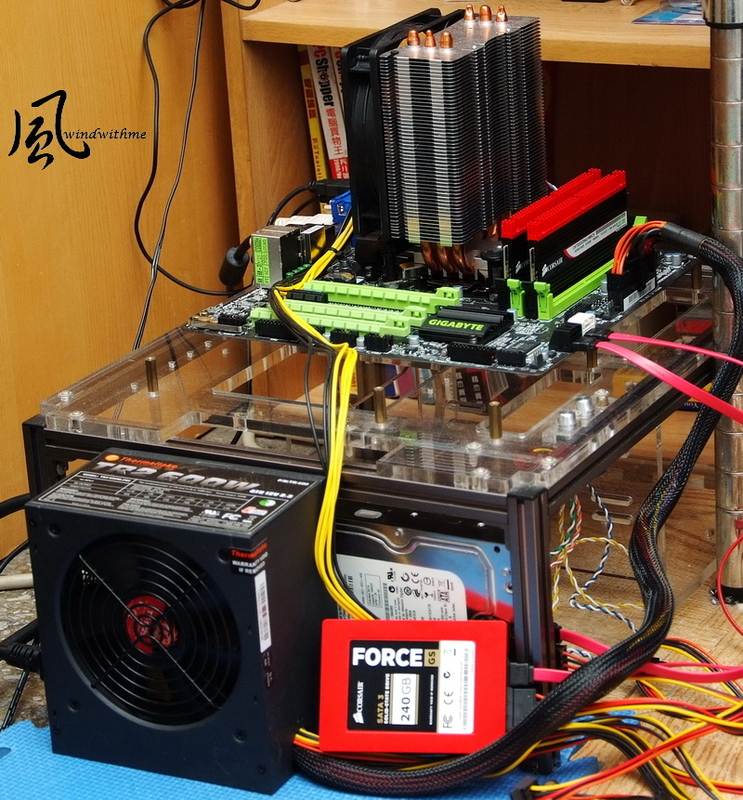 Windwithme mentioned several times when sharing SSD Raid 0 test. 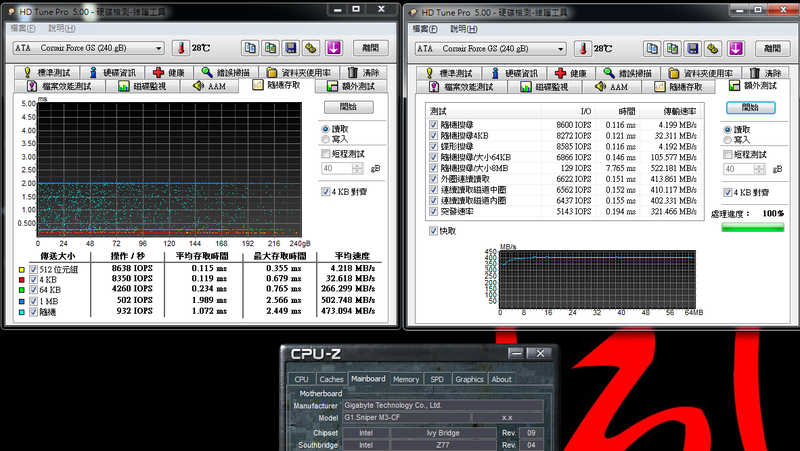 That moment, Intel Rapid Storage Technology didn?t support Raid 0 Trim mode. So the speed would drop after using for long time. Few months ago, Storage Technology Drive 11.5 released and official support Raid 0 Trim. This is really a good news for Raid 0 mode users. It also pushes SSD further performance and applications to wider range. SandForce SF-2281 controller has been launched over 18 months. From high end SATA3 SSD position to current 80% market share, the price is close to entry SATA3 SSD. As different service terms and warranty, the price is different. Popularity and price is SandForce strength. 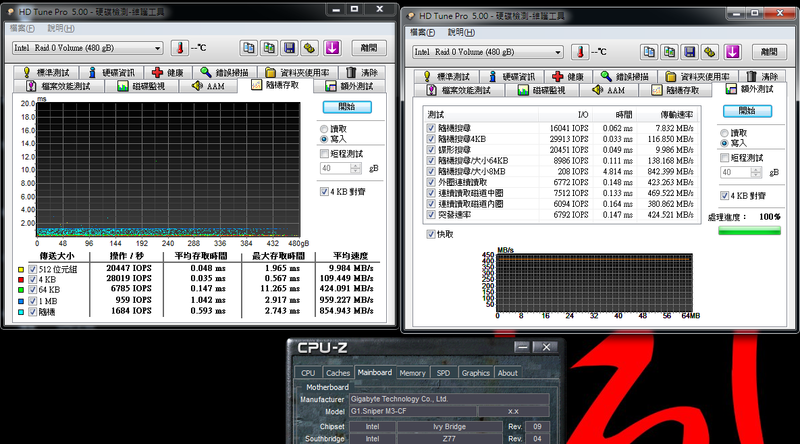 The weakness is random write beginning is risng from 200 more MB/s to 500 MB/s slowly. 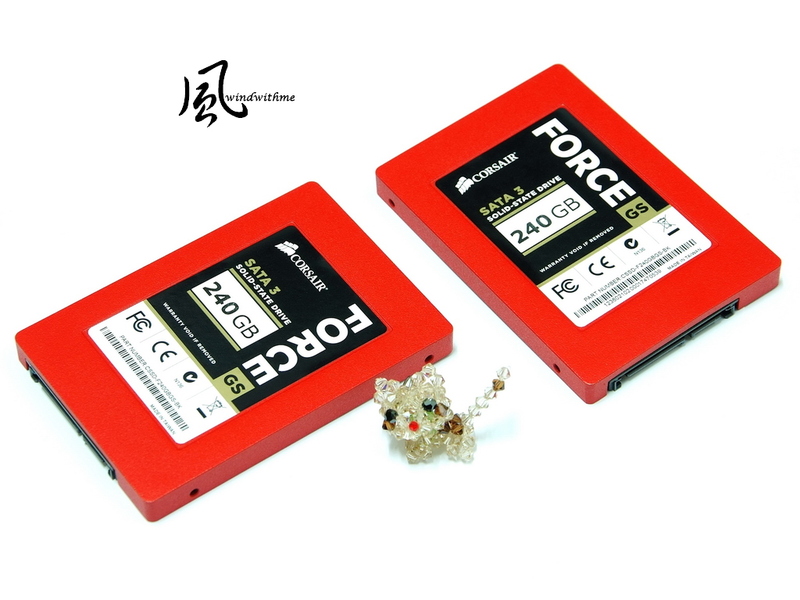 This time, CORSAIR Force GS uses different NAND Flash ICs. Some performance is improved a little. 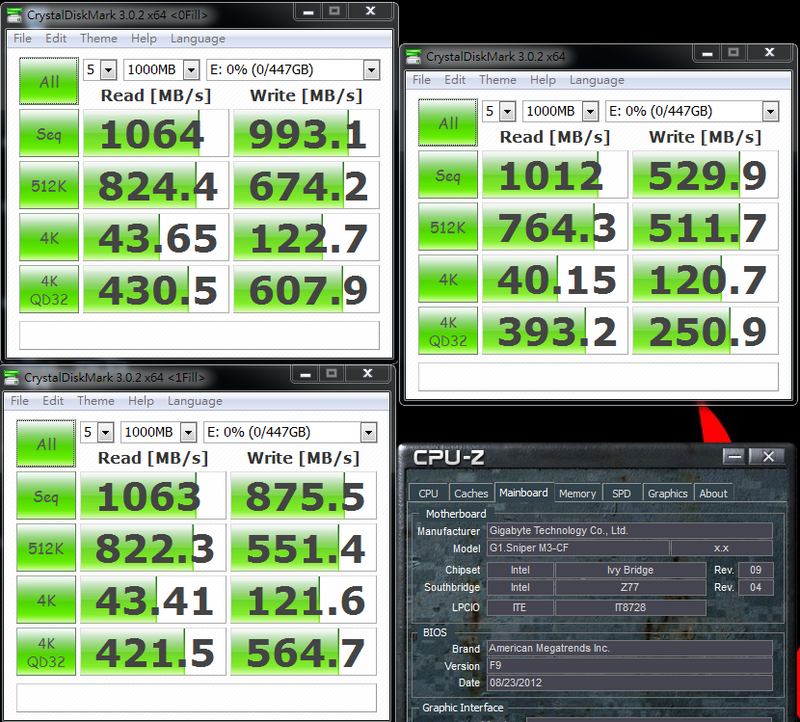 As Max Random 4k Write (IOMeter 08) over 90k IOPS (4k aligned) is the major improvement. This article shares you the different performance of SandForce SF-2281 controller with different NAND Flash. Also, Intel Rapid Storage Technology Drive high performance in Raid 0 mode. You can use it as your reference for further SSD purchasing. This article is also in my blog - WIND3C, Any comments are welcome. Nice review, ive always wondered how the above Raid0 compares to a Raid1 setup. 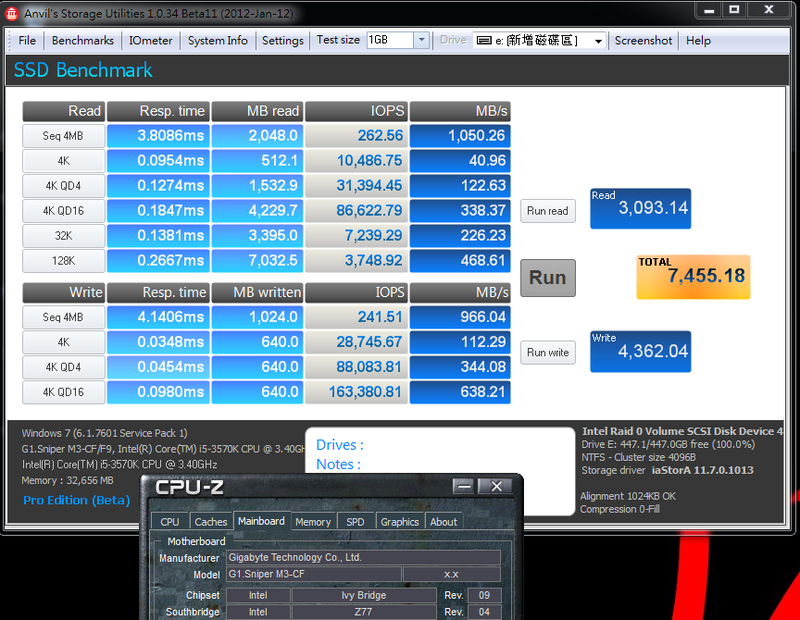 If you have the time could i ask u to run the benchmarks in R1? 1. Where/what drive is OS on? 2. 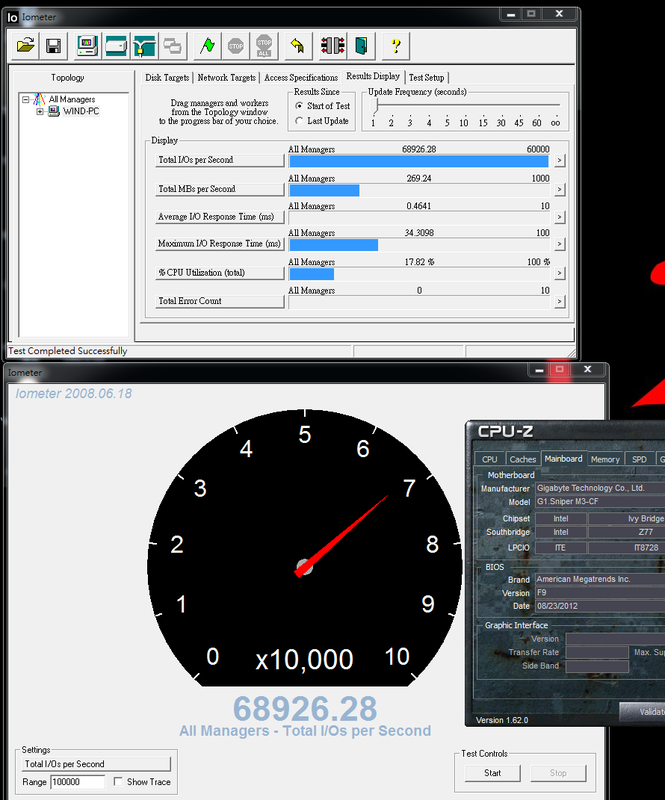 Redo the test with OS on the two raid 0 SSD drives', and no other drive/network on the system ! He stated quite clearly that that there is a 1TB WD HDD in the system, in fact you can see it in the system picture. Do I need an OS to be installed on the drives? Nope. Would an active file system on the drives preclude some tests? Yep. Would the results be half arsed with an active OS? Yep. Do I have a very good idea of what an OS would be like given the extensive information in this review? Yep. I've been searching to see how well other SSD's compare to mine. I haven't found an appropriate comparison yet, but in answer to your question here, I can offer my own HD Tune test with a pair of 120G Samsung 840s as system drive and no other drives installed.